After so many years investing in a bull market, we tend to forget things can go wrong. Some people are afraid and stay on the sidelines, but most of us keep investing. After all, those who have been waiting since 2012-2015 have already lost an opportunity they will never be able to recuperate. As our portfolio goes up, we tend to become greedier. +7% is not enough anymore, we want double-digit growth. This is what pushes many investors to take additional risks and aim for the sky for each transaction. I’m not this type of investor. I follow a meticulous investing approach that has paid me well for many years. However, I must admit that we all tend to forget what the worst can look like after so many years of profit. In 1903, Bank of the Ozarks, a small bank in Jasper, Arkansas, was founded. Things greatly evolved when OZRK went public in 1997. It started growing organically through multiple mergers and acquisitions. In 2018, Bank of Ozarks changed its name to Bank OZK to reflect its ambition of growing across the U.S. It mainly operates around savings and loan banking. The bank currently has 253 offices in 10 U.S. states. While lots of its offices are in Arkansas, Georgia, and Florida, its NYC facility owns the largest part of its loan portfolio. The small bank that sees big has a strong reputation in the savings and loan banking industries. As a classic one, OZK is well-positioned to benefit from the U.S. economic tailwind. The Tax Act should also boost earnings and open the door for more acquisitions. With the interest rate spreads improving, OZK should show strong numbers going forward. Finally, its Real Estate Specialities Group is a loan growth machine. OZK is leaving the crowded loan activities to focus on Real Estate Specialities. As the construction industry is healthy, RESG should be able to have solid results. When you look at the previous graph, you probably wonder what really happened to OZK, right? OZK is a strong regional bank growing through acquisition and through its Real Estate Speciality Group (RESG). Everything was rolling for OZK for several years. Believe it or not; OZK shares are still up by 257% since 2008 after losing 50% of their value in the past 12 months. The bank has been doing very well. However, OZK reminded us what 2008 looks like in a single announcement: charge-offs of $45.5M on two Real Estate Specialties Group credits. In other words; their marvelous growth division has been taking too much risk and got burnt.The market was fast (maybe too fast) to react and OZK lost about the quarter of its value in a single day. The OZK debacle didn’t affect the market too much. After all, we are talking about a small regional bank with a market cap of $3.3B. In comparison, the largest Canadian bank, Royal Bank (NYSE:RY), shows a market cap of $108.6B and JPMorgan (NYSE:JPM) is at $358.8B (literally 100 times bigger). We currently cover 191 financial dividend stocks (you can download the list here) and most of them show amazing metrics, similar to OZK. What I want to highlight here is that defaults will happen in the future. Cost of labor increases, interest rates rise, and commodities price are on an uptrend as well. All those factors reduce companies’ margins no matter in which field they are. Debt is now becoming an important factor you can’t ignore. You may want to make sure all your holdings can resist a recession before it’s too late. As you just saw with OZK, the market is quick to abandon underperforming companies. Nobody saw defaults coming in OZK’s case. Management tries to reassure the market and tells us that’s just two isolated cases, but investors didn’t buy it. I don’t know if OZK is telling (knowing?) the truth, but this pick has certainly become a lot riskier overnight. On the good side, OZK is not likely to cut its dividend (here’s my guide to avoid dividend cuts in your portfolio). 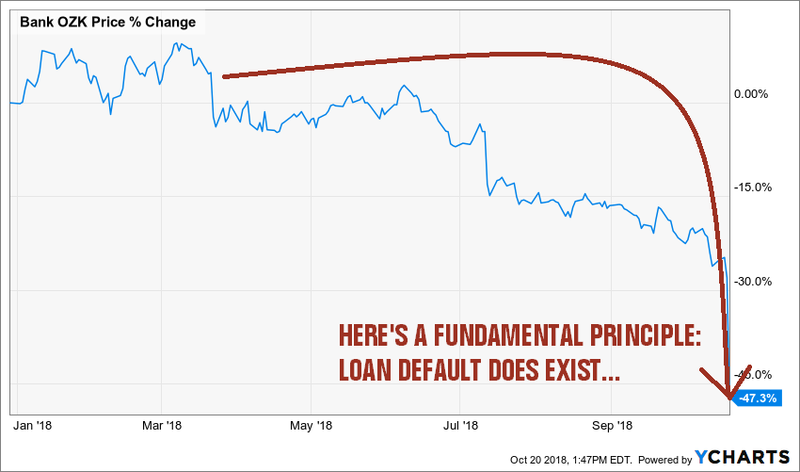 Current shareholders could probably get most of their loss back if next quarter is showing no major defaults. The bank remains solid, it just surprised the market with unexpected results. Analysts react very badly to surprises. 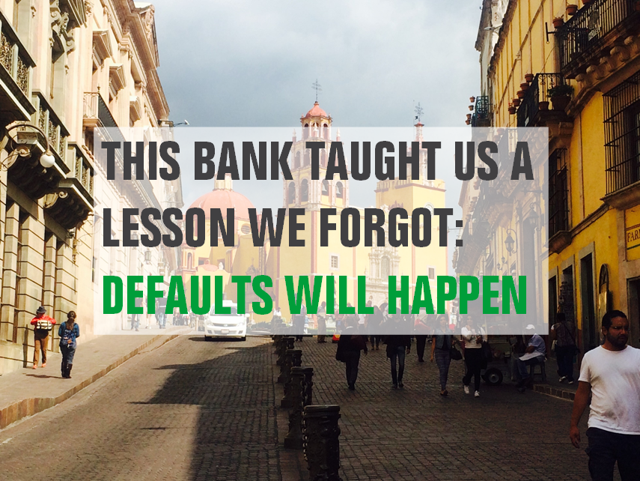 What this small bank reminds us though; it’s that default will happen, and investors must be careful. Do not take unnecessary risks based on hope. 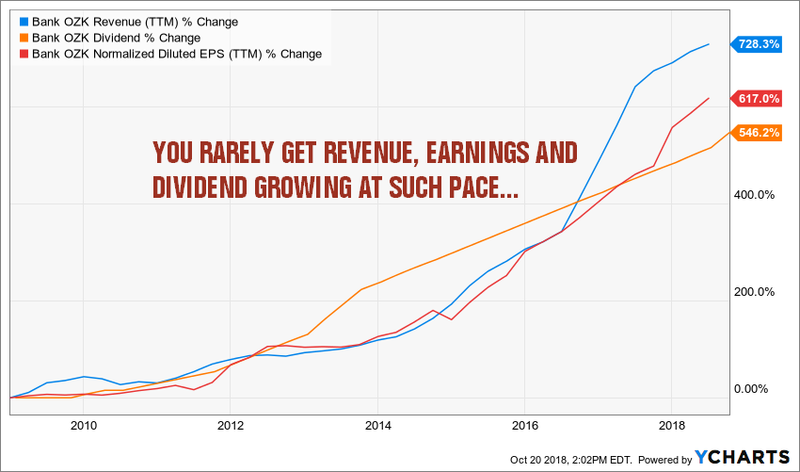 Stick to your investing strategy and make sure your companies are dividend growers. This is the part you will always keep in your pocket no matter what happens. SPX is heading towards 2,000?